Join the famous adventuring duo and save a longtime friend. "Jewel Quest: Seven Seas has a great storyline and wonderful graphics. Beautiful, fast-paced Match 3 games are always a lot of fun. Enjoy the terrific backgrounds and music, and visit different places to find the lost artifacts!" The famous jewel adventurers, Rupert and Emma, are back and unlike you have ever seen them before. After receiving a mysterious message from their old friend Hani saying that the Jewel Boards were in danger, the duo must work fast to save both the boards as well as Hani. But will they have to choose between the treasured Jewel Boards and their friend? And who is putting everyone in danger? Dive into this exciting adventure by matching jewels as fast as you can. 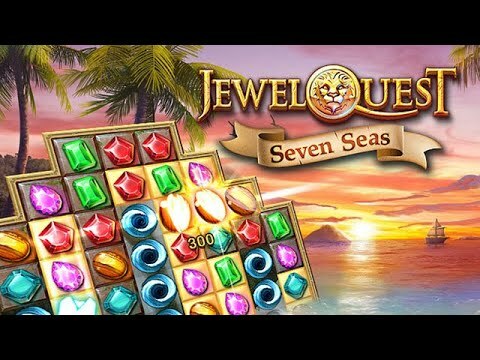 Jewel Quest: Seven Seas stays true to its roots, giving longtime Jewel Quest fans a pure jewel-matching experience while delighting new players with jewel-swapping tricks unique to this beloved series. Not so very far in this game and part of its beauty is that it has a long way to go so I will be with it a long time. The matching of the jewels has a new twist with each board, some of which are explained, some are left to you to find an answer. If that is not enough, there is an ongoing story which, while mildly interesting, provides an excuse to generate lush, lovely backgrounds. Great combination of fun reasons to play and to continue playing! It's your typical Match 3 game, which is pretty easy to understand and play. It moves fairly fast once you get the hang of it. This game was interesting. It's different from the typical Match 3. One new idea can make the game. I really enjoyed this game as I have all the Jewel Quest games. It is just hard enough to be enjoyable. I love this game. It is fast and keeps you thinking. The game was fun. I like to play games that have a time limit. It makes it more interesting. My wife discovered this game while playing Jewel Quest Solitaire 3 and she loves it! She really enjoys this twist on it.